If you can find five minutes to squeeze in a core workout, I’ve got a quick and effective one for you to try. Level 1: perform each exercise for 30 seconds, and then rest for 30 seconds before moving on to the next exercise. Level 2: perform each exercise for 45 seconds, and then rest for 15 seconds before moving onto the next exercise. 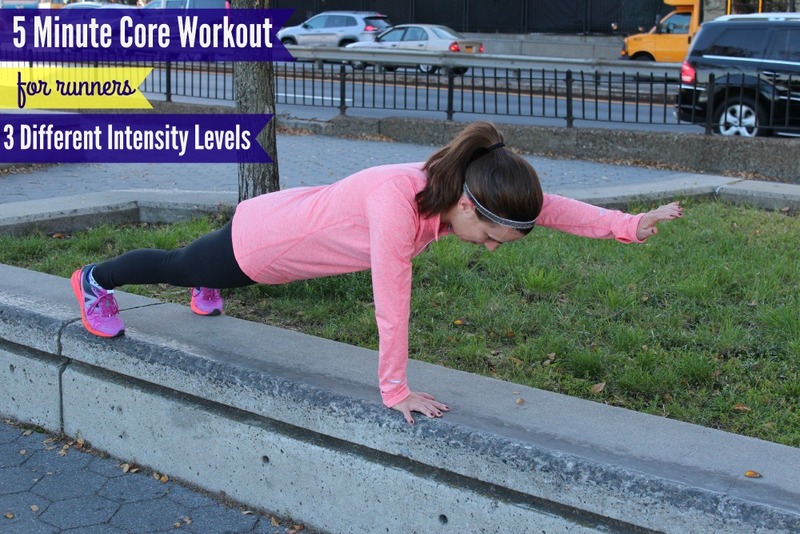 Level 3: perform each exercise for 60 seconds, and then move directly onto the next exercise as quickly as possible. #2: Set a timer for your desired intervals. Looking up at a clock can compromise your form. #3: Perform each of the exercises below in order for the amount of time indicated in step 1. Note: No matter what intensity level you choose, do not rush through the exercises. They are to be performed with control and precision. This isn’t a workout where you’re trying to see how many reps you can do in a given amount of time. Note: Try to keep your hips squared up to the ground when reaching your arm out. Note: When rotating into the side plank, try to keep your hips lifted. Note: Keep your abdominals engaged while lifting your arms and legs off the ground. Contract your lats by pulling your elbows down by your ribcage, as if you’re doing an invisible lat pulldown. Notes: Try to keep your hips as stable as possible. When you pull your knee and elbow towards one another, imagine doing an upside down crunch. Notes: Try not to move your hips up and down like you do when performing a regular mountain climber instead use your abdominal muscles to stabilize the torso. This post originally appeared on Women’s Running where I blog weekly. I don’t think there’s anything better than planks to develop a nice strong core! These are some great variations and moves I’ll definitely try.